To celebrate 25 years of cityhood, West Hollywood collaborated with the Museum of Neon Art for the ultimate party decorations! 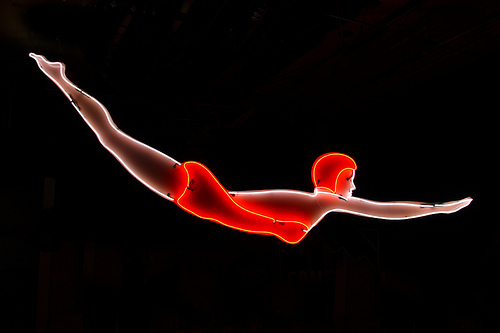 The Diver, La Fonda, and Zinke’s Shoe Repair neon signs can be eyed along the Santa Monica Boulevard center median near Barney’s Beanery while the Winchell’s Donut sign pops up in Plummer’s Park. MONA’s neon cruise guide Eric Lynxwiler (dubbed “Mr. Saturday Night” in L.A. Weekly’s “2010 People” ) has written a special Route 66 tour map for the occasion and a special WeHo/Route 66/Sunset Boulevard neon tour is in the works. (Sign up deets below, Go Go’ers!) You can pick up a free brochure with information on the 50+ WeHo neon sites at MONA, WeHo City Hall, and the Plummer Park Community Center (just follow the Winchell’s Donut sign!) or check out the gorgeous Flickr slideshow on the WeHo site, which has detailed descriptions of Route 66 and WeHo-adjacent neon. Bar flies, rockers, dive drinkers, and other lush lifers are bound to find much of this neon very, very familiar. Whether before or after a celebration of caged lightning, what better place to drink and dine than at Larry Nicola’s Mexico Restaurante y Barra: the eatery inspired by a neon sign (spotted by Nicola in a Mexican antique shop) and informed by the chef’s passion for south-of-the-border comida y bebida. 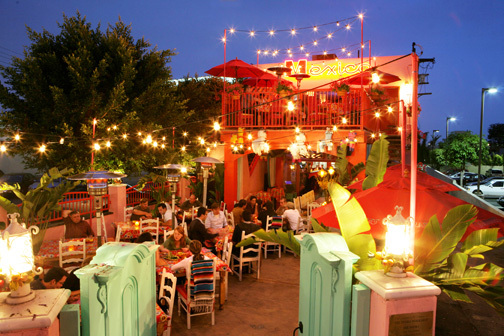 The famous wood-fired oven is responsible for signature dishes such as duck taquitos with mole and chile rellenos with queso Oaxaca; the 5PM – 7PM happy hour is responsible for the $4 cervezas and $5 premium margaritas. In other words, you’ve got plenty of time to start the anniversary party early before ambling over to the grand opening. Giving you a chance to be as lit up as the art.